Ready to make lip balm? This all natural, tinted lip balm is so lovely. I’m wondering why I wasted years using anything else. When I finally took the leap and ditched most of my makeup (something I never thought I would do with my acne-prone skin), the only two things I didn’t want to give up were my tinted Burt Bee’s lip balm and my organic mascara. I like the extra moisture on my lips, and some days your eyes just need a little “punch” to make you look… awake. Right? But in all honestly, I was a little annoyed that I still was buying these two things when I knew I could make them myself. And even though they both claim to be “all natural,” the ingredient lists are not quite as “pure” as I’d like them to be. Besides, you can make lip balm (and mascara… but that’s for next week) so easily! And it is so empowering. I love learning how to work with different ingredients and herbs to make my own beauty products. It’s just fun. So let’s make lip balm, shall we? I’ve seen a lot of great recipes around the internet for homemade lip balm, but I knew I wanted one with a little bit of color. (I’m really pale, so a little hint of color helps me look less ghostly.) The problem: Most tinted lip balm recipes that I could find used lipstick as the coloring agent. Um? I thought the whole point was to get away from toxic cosmetics? Right? Then I came across an idea: Alkanet Root to give the lip balm color. Perfect! I’ve also wanted to see what would happen if I used a little Hibiscus powder (both Alkanet Root and Hibiscus are herbs). It’s such a beautiful color so I thought I’d try it out. So with just a few minor tweaks to the Frugally Sustainable recipe, I have perfected my own version of tinted lip balm! To make lip balm, all you need are some basic ingredients, some clean containers, and lots of love. 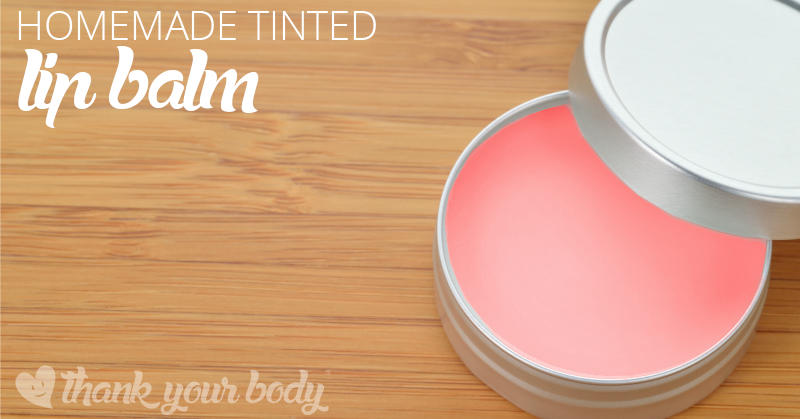 Of course you can leave out the herbal powder if you don’t want a tinted lip balm. *I love to use oils like grapefruit or sweet orange. Other popular oils are peppermint, lavendar, or vanilla. Experiment and have fun. 1. In a small saucepan, over low heat, melt coconut oil, jojoba oil, cocoa butter, and beeswax. Stir until just melted and then remove from heat. 2. Stir in vitamin E, essential oils, and herbal powder. Mix until completely incorporated. Yield: This recipe will fill about 4 – 6 half-ounce containers. I love both the colors. The Hibiscus is definitely more subtle… my kind of thing. Now that we know how to make lip balm, get ready for next week’s diy tutorial: Homemade mascara! Get excited.